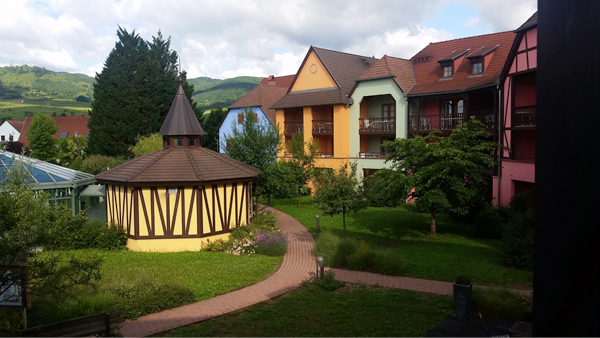 Our fabulous eight day holiday in the Alsace wine region and the champagne with a 1-day visit to the Black Forest in Germany. The pictures tell part of the story about a wonderful place: spiky clean, organized, stunningly beautiful. During our stay in June, we had hot weather and unusually clear days, no haze, every day. The village Main Square and one of the many churches. 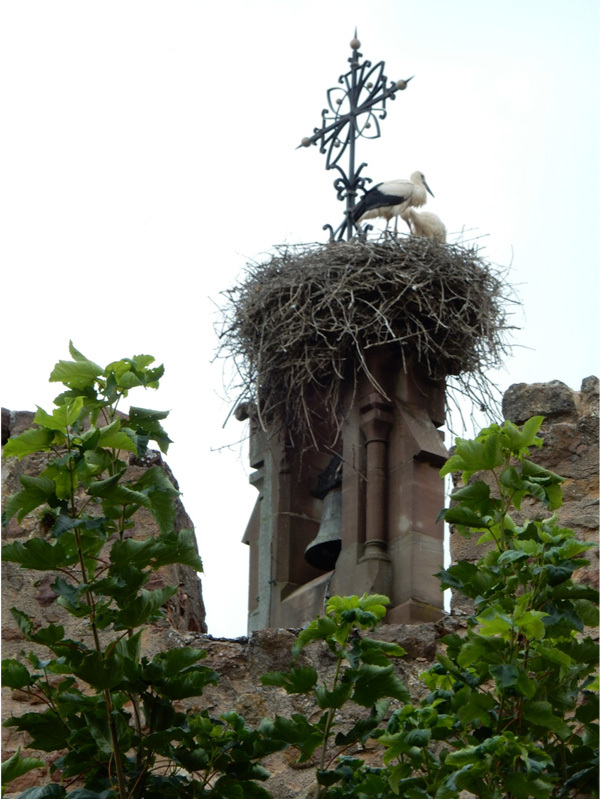 If you look at the photo above closely you'll see storks nesting on the spire. The spire celebrates one of Eguisheim’s notable people: Pope Leo IX, 1002 - 1054, pope of the Roman Catholic Church from 12 February 1049 to his death in 1054. Our ‘home’ for 8 days, including a 2nd floor apartment with 2 bedrooms, a living room, kitchen, balcony, and two bathrooms. Picture taken at the start of our day. Pierre et Vacances, Eguisheim, Alsace in Eastern France. The village’s main roundabout. Quiet looking, well, it often is extremely quiet here. 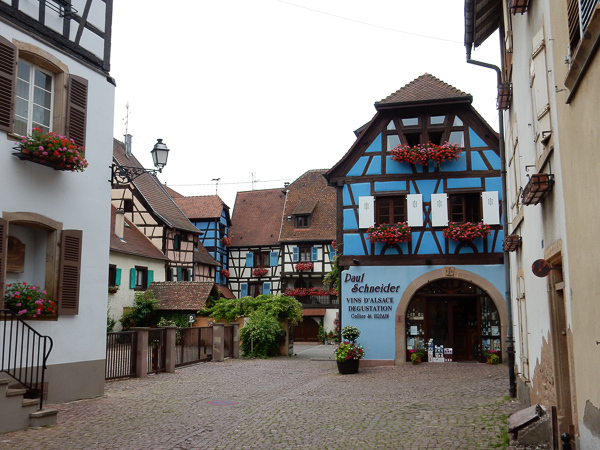 This first set of pictures is of the village of Eguisheim, on the wine route in the Alsace wine region, with its homes built from the old centre to the perimeter in concentric circles. Intriguing with wonderful flowers and more than a fair share of wine merchants (houses) offering their products and tasting. Foie gras and other types of pâtés and cheeses are also available in abundance. And some of the restaurants are an absolute treat! 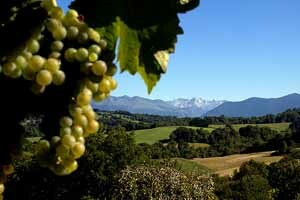 More info on the regional food of Alsace. 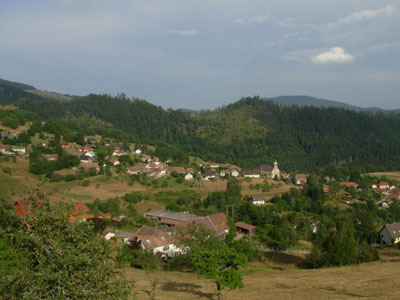 A commune in the Haut-Rhin department in the Alsace in north-eastern France. 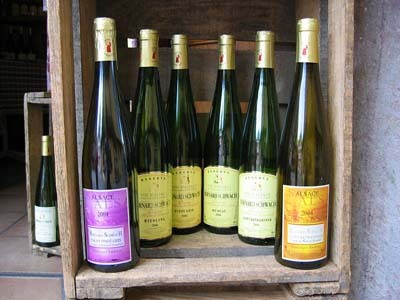 Eguisheim produces Alsace wine of high quality. 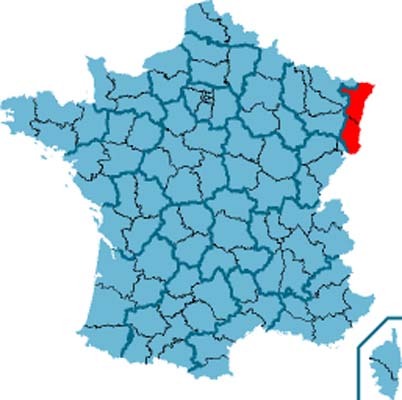 In May 2013 it was voted the “Village préféré des Français” (Favorite French Village), an annual distinction that passes from town to town throughout France. 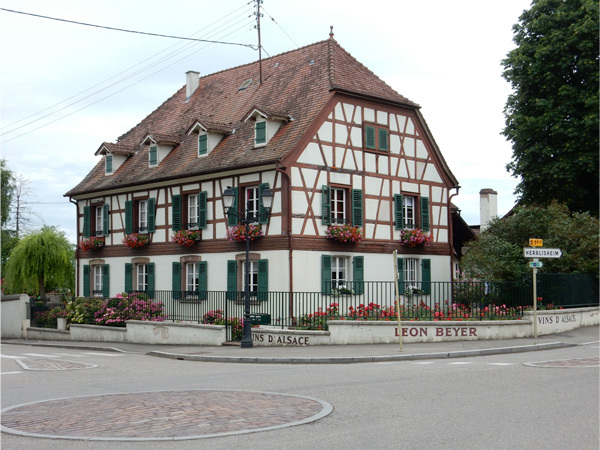 A typical Alsace wine merchant operating in the close vicinity of his vineyard. The photo above is taken from the main “Grand Rue” that runs through the village in north-south direction. 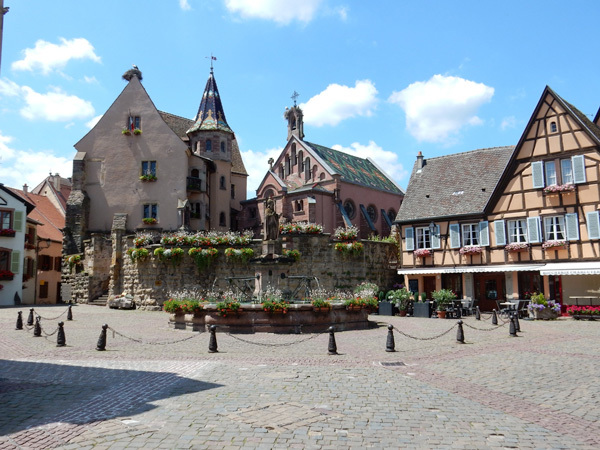 Just a short distance from Colmar, Eguisheim is the birthplace of wine growing in the Alsace wine region and also the village where Pope Leo IX was born. The village is proud of its concentric, cobblestone streets and its floral decoration, which has won national and European awards.Visitors can admire the beauty of its 16th and 17th century houses with their pointed roofs, bright colours and half-timbering. 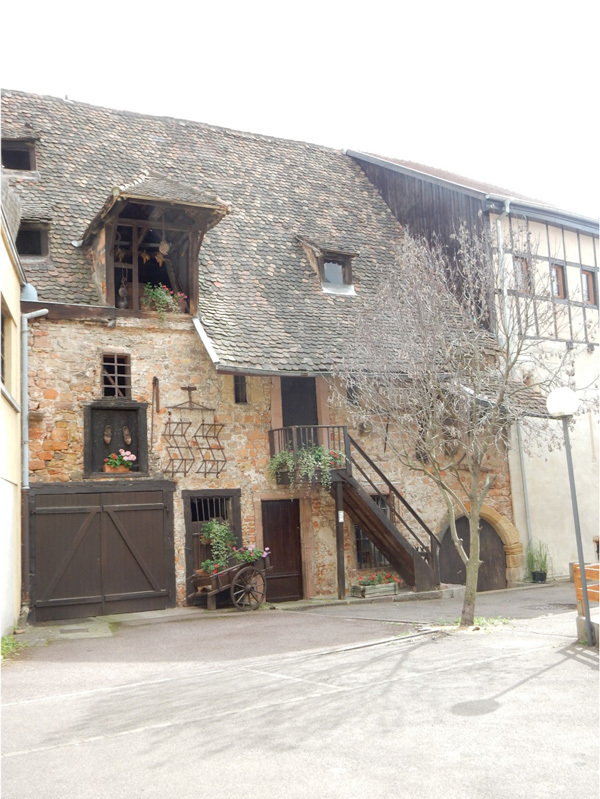 A more traditional farm house in Eguisheim, close to the village centre. The storks! There are many and they keep to themselves. But the stork is a symbol in these parts. 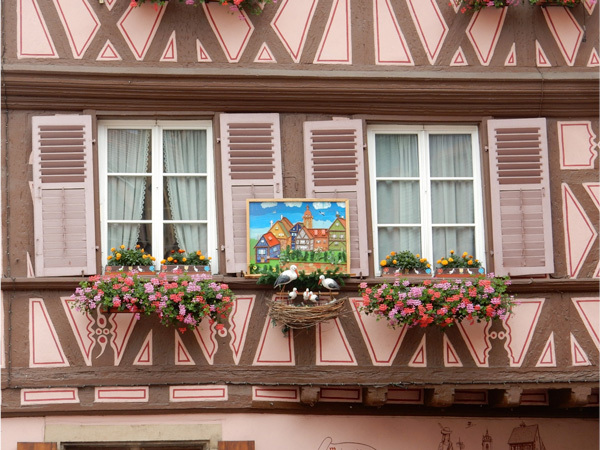 A house in Colmar, the neighbouring city. Close to Eguisheim and built on a mountain summit, Hohlandsbourg Castle offers a magnificent all-round panorama over the plain of Alsace and the Vosges Mountains. Definitely worth a visit. In clement weather, you can even make out the spire of Strasbourg Cathedral and the Swiss Alps. This garrison stronghold built in the 13th century was the seat of the Lords of Habsburg. 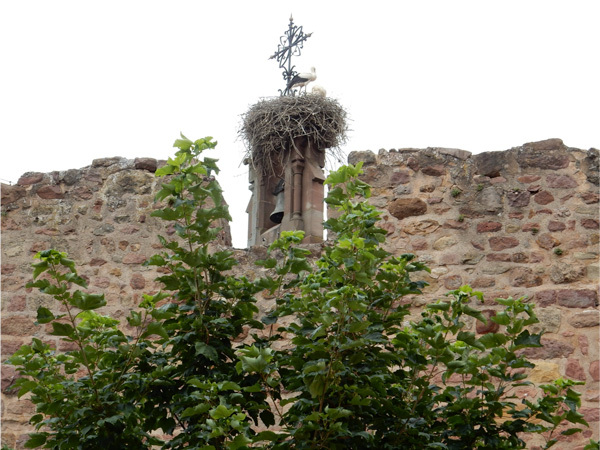 This is the largest fortified castle in Alsace. 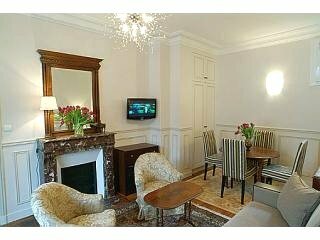 Over the past years, the castle has been completely restored. Today, it is a centre for culture, exchange and sharing with several events staged in this superb green setting from Easter to 11 November. 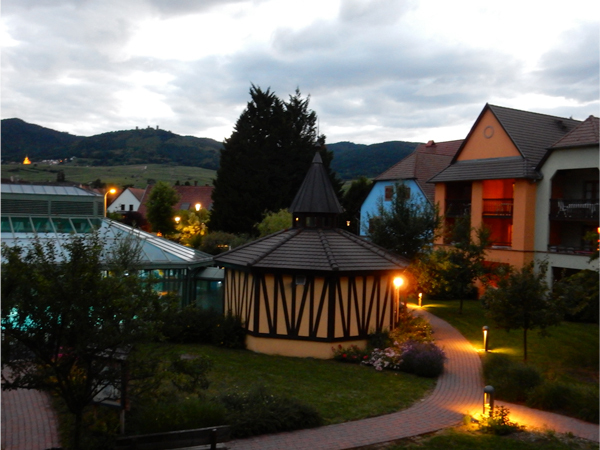 Back ‘home’, a shot of the complex with the ‘three castles’ of the village in the background. The three towers on the Schlossberg hill (591m) overlook the Alsace plain and date from 11th to 13th centuries. The middle tower, the Wahlenbourg, is the oldest. The Dagsbourg to the north and the Weckmund to the south were built in the 13th century. The Wahlenbourg: the oldest of the three castles was constructed in 1006 by Hugues IV, Count of Eguisheim and his wife Heilwige, Countess of Dabo, on the site of a Roman watch tower. In 1026, the castle was destroyed by Duke Ernest of Swabia. The edifice was divided into three distinct parts: at the top was the Count's Residence, below was accommodation for family retainers and officers, then at the bottom were barracks for soldiers and the stables. The Weckmund : At the death of the last direct descendant of teh Counts of Eguisheim-Dabo in 1225, the Counts of Ferrette became the closest heirs, but their claim was disputed by the Bishop of Strasbourg who declared war and occupied the castles of Eguisheim. In 1226-1227, King Henry of Germany, ally of the Counts of Ferrette, built this siege tower in the mower yard to control access to the castles. When peace returned, the Bishop retained the Dagsbourg and the Weckmund reverted to the Count of Ferrette. All three castles were destroyed in 1466 during the War of the Six Oboles. Guest contributor Norman is a United Nations peacekeeper and is currently on a mission in Africa.